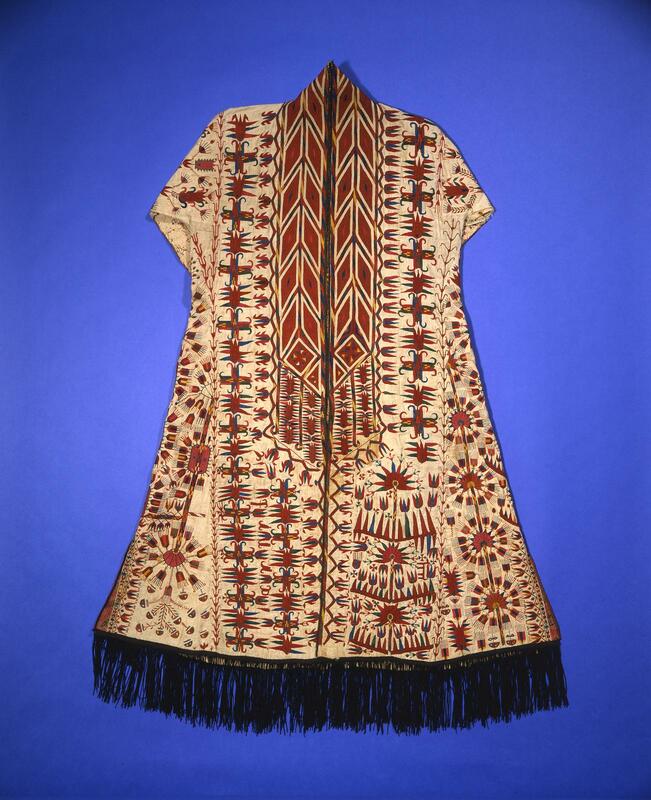 Hand-embroidered women’s coat of natural dyed silk and cotton; Turkmenistan, Central Asia, ca. 1890, # 99-24-1. Devil, Devil, Love, 1970, Cotton belting, acrylic, beads, thread, and wood, 96 x 194 in., Museum Purchase, Mr. and Mrs. Robert F. Carney Fund, 2007.15. 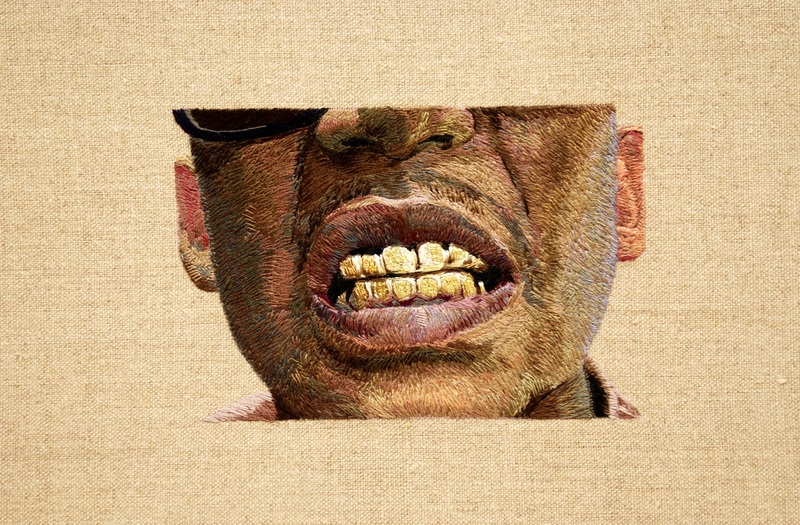 Daniel Kornrumpf, No Mold Gold Teeth, 2013, Hand embroidery on linen, 42 x 36 in. (detail). In 2017, the Coby Foundation awarded $556,000 in grants, the highest amount in its 16-year history, supporting projects throughout the Northeast and Mid-Atlantic. The Foundation supported twenty projects that ranged from artist installations to ethnographic fashion to an exhibition examining shopping for clothing. The largest grant went to the Penn Museum at the University of Pennsylvania. Coby funds will allow for the display of textiles in newly renovated galleries. Featured will be luxury items, Persian silks from the 16th and 17th centuries that tell the story of global trade and also works collected from the Turkmen people of Central Asia ($100,000). The Fabric Workshop and Museum received the second largest grant for Process and Practice: 40 Years of Experimentation, which pairs evocative items taken from almost 60 boxes containing process materials from its artists residencies with the finished works that were produced in FWM’s Workshop. ($90,000). 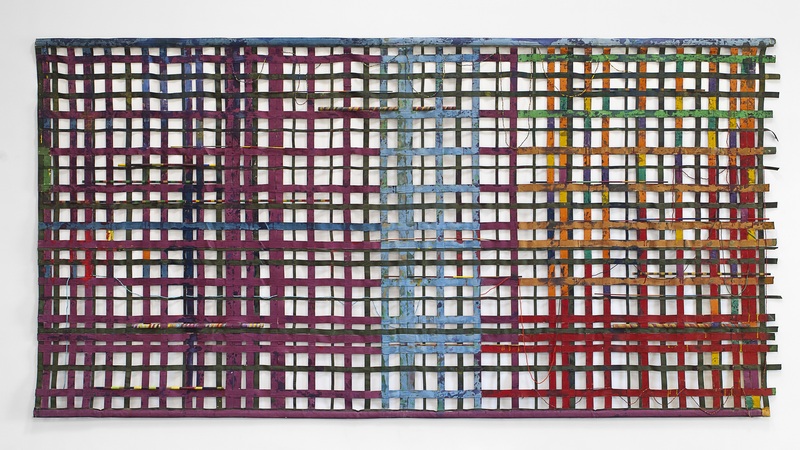 Other grants for contemporary projects went to the Everson Museum of Syracuse for Sheila Pepe: Hot Mess Formalism ($44,000); the Mattatuck Museum (CT) for Ùtútù, an installation by Nnenna Okore, who used textiles to commemorate the colors and landscapes of her childhood home in Nigeria (5,000); and the Philadelphia Museum of Art for an installation by Korean-American artist Jean Shin ($30,000). The Parrish Art Museum created a special installation of works by the late Alan Shields ($45,000); and the Addison Gallery of American Art (MA) mounted Invisible Citings, joining embroidery by Elaine Reichek with sculpture by Jeanne Silverthorne ($20,000). The Hunterdon Museum of Art (NJ) mounted a group exhibition entitled Intimate Lines: Drawing with Thread that dealt with relationships, gender and identity ($16,000). The Coby Foundation supported an unusual variety of fashion-related exhibitions, ranging from a James Galanos retrospective at Drexel University’s Fox Historic Costume Collection ($40,000) to Fashioning the Women of Weeksville at the Weeksville Heritage Center in Brooklyn ($15,000) to the Jewish Museum’s Veiled Meanings: Fashioning Jewish Dress, from the Collection of The Israel Museum ($50,000). The Foundation is also supporting an ambitious exhibition, The Fashions of Fiction from Pamela to Gatsby at the Fashion Archives & Museum of Shippensburg University (PA) ($40,000) and the conservation and exhibition of a contemporary African gown, called Esther, by Nigerian designer Patience Torlowei at the National Museum of African Art ($12,000). Another project consisting of conservation and subsequent exhibition is the textile collection belonging to artist Marsden Hartley at the Bates College Museum (ME) ($19,000). The Concord Museum’s Fresh Goods: Shopping for Clothing in a New England Town, 1750–1900 considers the shopping habits of Concordians in the 18th and 19th centuries ($25,000), while Historic New England’s Head to Toe: Hat and Shoe Fashions showcases 46 hats and pairs of shoes worn in New England from the 1750s to the present, exhibited at the Eustis Estate Museum and Study Center in Milton, MA ($24,000). Both are part of the statewide MASS Fashion collaborative project. Other 2017 Coby Foundation grants went to the Peabody Essex Museum for The Last Empresses of China ($40,000), the Textile Museum at George Washington University for A Nomad’s Art: Kilims of Anatolia ($25,000), The New England Quilt Museum in Lowell (MA) for planning the exhibition Quilting the Dark Side ($10,000); and Esopus Magazine’s Ernest B. Haight: Sewing and Reaping, which examines his production of 400 quilts ($6,500).